What could spoil a perfect run during a firefly-filled night in Central Park in early summer? 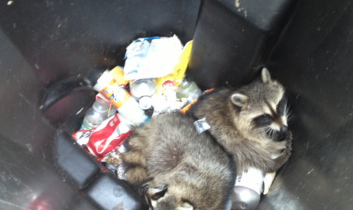 A surprising discovery: two very young raccoons stuck in a garbage bin. The strange, almost dolphin-like noises coming from the bin alerted me that something was very wrong. As I got closer, the sounds became somewhat frantic. Once I mustered the courage to look into the bin, not knowing what, or whom, I would find, I saw two incredibly cute but terrified faces looking back at me. In the panic of the moment, trying to figure out the fastest way to get them out, I lowered my sweatshirt into the bin. It worked! One of the baby raccoons climbed out, using the shirt as a ladder. Then, in an incredibly touching moment, instead of running away, the escapee started circling the bin and ultimately even jumped back on the rim, trying to help his or her sibling get out as well. Rescuing the second baby, who was obviously more timid, was a bit more of an ordeal, but soon the two were reunited at the top of a nearby tree. For the rest of that night, I could not shake the thought of these raccoons getting stuck in the bins again. 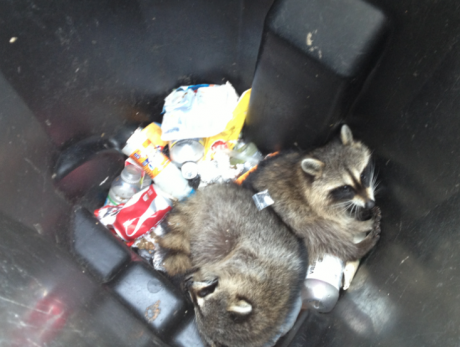 So, at 6 a.m., I returned to the park, only to find the pair in another bin, a short distance from the original one. 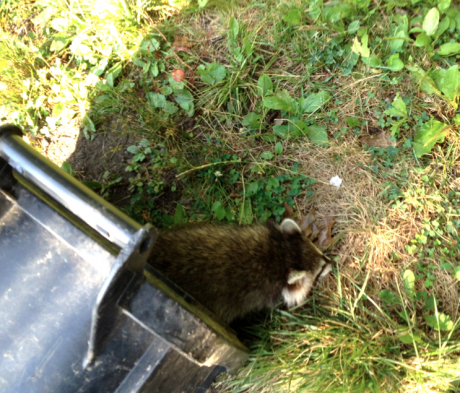 This sad discovery was the beginning of an ongoing effort to help the raccoons of Central Park. 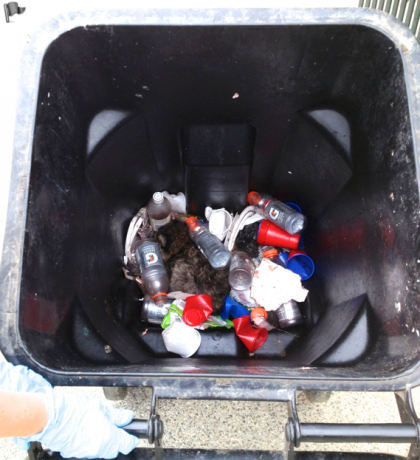 After the first two weeks of going back to the park every morning and regularly finding raccoons trapped in bins, it became clear to me that this problem was not going away, nor was it something I could manage on my own. Because this was probably happening all over the park, more people were obviously needed to cover other areas. Moreover, letting the raccoons out in the morning would not necessarily resolve the problem. 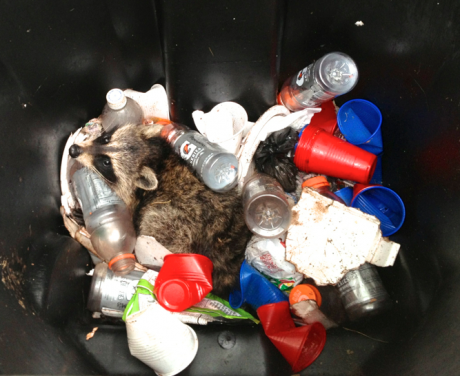 Once these raccoons get stuck in a garbage bin, they are trapped all night without food or water. Most of these bins contain little other than dog waste and inedible litter. Because raccoons are nocturnal, and because it is hard for them to forage during the day among the myriad of people and dogs enjoying the park, this terrible situation ultimately jeopardizes their survival. It is like being really hungry and going to an empty restaurant that locks you in, over and over again. Social networking was key in this process. 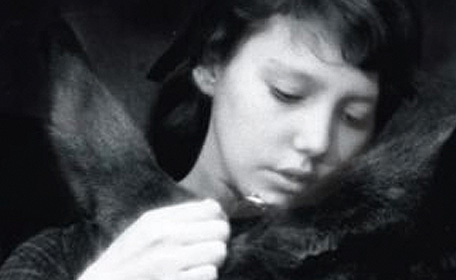 I reached out to animal advocates whom I knew, and asked for help in spreading the word. I needed ideas on how to deal with this situation, and I even needed legal advice about potential liability. 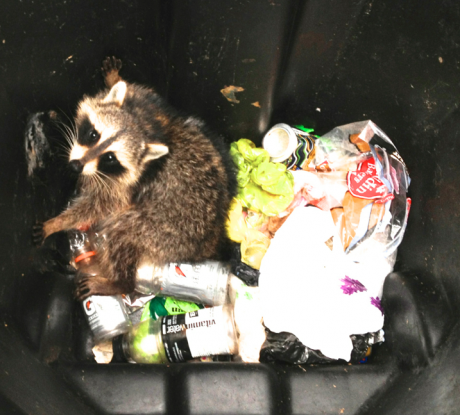 Once a core group of volunteers was formed, we developed an efficient process to release the animals, and we implemented a temporary procedure to prevent them from getting stuck in the first place, by placing tree branches, found on the ground in the park, in the bins, thus allowing the raccoons to climb out. Many individual animal advocates helped, and local advocacy groups even circulated newsletters dedicated to this issue. One extraordinary volunteer, Laura Lincks, has been instrumental with her Sisyphean effort to map out the location of all the problem bins in the entire 80 acres of Central Park. Her work has been crucial in directing volunteers. Once we found some short-term solutions, I began to think of what we could do for the long term. I envisioned our team evolving into an official volunteer group that would work with other advocacy groups and become incorporated under the umbrella of the volunteer division of the Central Park Conservancy, the organization that maintains and operates Central Park. This vision became the Central Park Wildlife Taskforce (CPWT). From its humble beginnings, the taskforce quickly garnered the support of animal protection groups such as Friends of Animals, In Defense of Animals, GooseWatch, and Wild for Prospect Park, not to mention the involvement of a great team of volunteers, as well as licensed wildlife rehabbers who provide advice. Once CPWT was established, we were very pleased to be invited by the Conservancy president, Doug Blonsky, to meet and discuss our efforts and the problem with the bins, and we now have a dedicated contact person at the Conservancy who works with us. Best of all, the park employees are now aware of the issue, and they release the animals whenever they find them. Unfortunately, even though significant progress has been made, we have not yet solved the root of the problem. The obvious question is: Why are the containers in Central Park not wildlife-proof? The Conservancy will be replacing its problem bins with better-designed bins; however, even the new ones do not appear to be wildlife-proof. Thus, our work remains essential. It is still my hope that our taskforce can be incorporated under the umbrella of the Conservancy, thus ensuring that the problem will continue to be addressed. 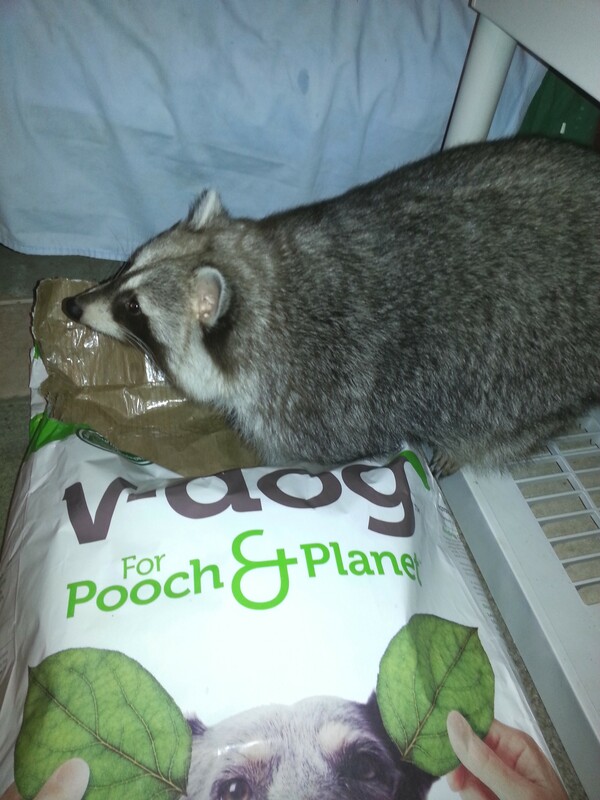 Even better, other issues related to the raccoons’ well-being in the park could be handled as well, such as educating the public to respect wild animals, and working to counter and prevent the fallacies that plague the image of wild animals – raccoons, especially. In the meantime, CPWT will be there to help our wild urban neighbors. We hope that our story motivates others to take action and use the power of community and especially the strength and dedication of the network of animal advocates. Note: At this point, CPWT has sufficient volunteers; however, if you wish to place yourself on the list, please email cpwildlifetaskforce [at] gmail [dot] com. Loredana Loy recently graduated with an interdisciplinary master of arts degree in media and sociology from New York University. Her research examines the role of media-generated public discourse as a tool for social change for animals and society. She is also the newsletter editor for the American Sociological Association’s Section on Animals and Society. Loredana bridges the gap between academia and advocacy through doing consultancy work for organizations such as Animal Equality in the United Kingdom and the Humane Research Council in the United States, and by writing critical media reviews for advocacy groups. Loredana is currently preparing to pursue a PhD in sociology. Thank you thank you THANK YOU Loredana and all of the vunteers for your efforts and advocacy on behalf of urban wildlife. Your efforts are so commendable!